Swindon Viewpoint was first constituted in 1958 and over the years we've used many generations of communication technology. More than almost any other broadcaster in the UK. Here is the brief history of the nuts and bolts that have helped to put images in front of your eyes during this time. When Swindon Viewpoint began, video technology was in its infancy. Almost all television was produced on 16mm film and broadcast through a projection device. But film is expensive and challenging to work with, you couldn’t easily record sound at the same time for example. Films were made in Swindon prior to Viewpoint, - as you can see from browsing our archive, but the medium wasn’t well suited to access television for cost and technical reasons. Film played a part in Viewpoint’s launch nonetheless, for the Viewpoint logo. It wasn’t possible construct logos or do animation on videotape at the time. Ampex developed the first video tape recording system in the late fifties; these machines used two-inch wide magnetic tape and were behemoths needing a fork lift truck to move them about. A somewhat slimmed down version followed in the late sixties though it wasn’t initially adopted for television. The picture and sound were recorded together on one-inch wide open reel magnetic tapes. 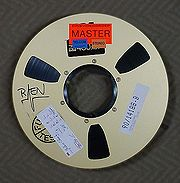 These needed to be carefully threaded onto large and heavy reel-to-reel recorders. EMI equipped Swindon Viewpoint at the outset with 1” video recorders made by Sony; at over 90lbs they still weren’t portable. One went out in the Viewpoint Range Rover while the others were back at the Studio. They could record up to an hour on a fat 8-inch reel. 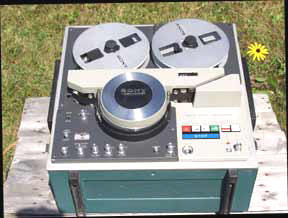 One-inch Tape machines; - most of Viewpoint’ studio and location programmes from 1973 to 1977 are on this format. The star turn however, - at least for public access, was that EMI also supplied us with several of the newly developed half-inch portapaks. 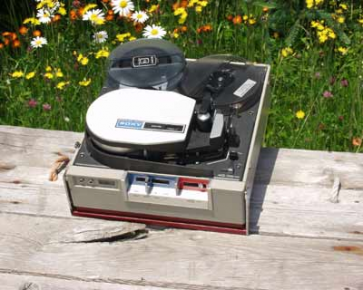 As the name suggests, these used half-inch wide reel to reel tape and were much lighter, although at around 40lbs they were still cumbersome in today’s terms and the battery didn’t last long at all. The important point though was that, for the first time, members of the public could take them out and about and record for themselves what they were involved in. Everything had to be brought back to base for editing and this was a hit and miss process involving hooking two machines together, spinning them up to speed and trying to transfer from one to the other the programmes segments you wanted, - in the sequence you wanted them. There was usually a glitch in the picture at the edit point! - Especially if a 'Time Base Corrector' wasn't used. 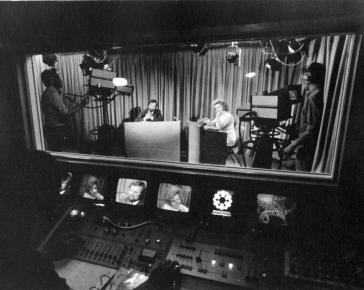 For the first time though, people could with a little dedication make their own TV, and Swindon Viewpoint was the pioneer in facilitating this. For an example of an early programme made on the half-inch portapak; watch Pinehurst challenges the Planners, or Playschemes in the Archive. Arguably picture quality, or at least resolution, went down somewhat with the move to colour, although that didn’t seem to dent its popularity at all. The cameras Viewpoint purchased were Sony DXC1610 single tube affairs. For outside work and public access these were married up to a Umatic portapak, if anything these were even heavier than the half-inch Rover! In the studio, programmes were recorded on the larger mains Umatic recorder. Umatic became a very popular format and was fairly reliable for its day. Video still needed to be edited by copying segments of recordings onto another machine in the desired sequence, but with Umatic it became a little less hit and miss. The development of an edit controller meant the two machines could be locked together in electrical synchronisation (with the pictures on both machines starting and completing their scans at the same time) this meant less picture disturbance at the edit point. They could also be automatically back-rolled an equal amount and run up to speed together meaning a more precise edit point for the transfer. This setup served right up to 1986 when the funds raised from regular commercial rental of the kit was used to upgrade to Umatic SP, a development of the same format with much improved picture quality. At the same time 3 tube cameras were purchased, which radically improved the picture quality of programmes. A 3 tube camera that made most of the Viewpoint programmes in the late eighties and early nineties, yes, the recorder was still separate! Looking back over all these years: As well as the gradual improvement in size and weight of equipment, and in the picture quality attainable, another major factor has been a gradual improvement of cameras ability to get results in poor lighting conditions. Just look at the number of powerful lights needed on the ceiling of the early Viewpoint studio for example. Often out on location, community users found there simply wasn’t enough light to get reasonable results. So bear all these things in mind when you watch productions from the early days of video technology. Those producers demonstrate quite considerable dedication when you take into account the handicaps of the medium at the time. Nowadays of course we have tiny camcorders not much bigger than your hand that perform well in low light and give superb picture quality. 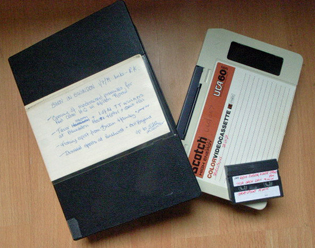 They no longer need tape; the recording goes straight onto a small hard drive or memory card that then plugs directly into home computer software for easy and precise editing. There are no comments for "How it Works".